In 2014, the World Health Organization (WHO) started the “Better Outcomes in Labour Difficulty” (BOLD) project to accelerate the reduction of childbirth‐related maternal, fetal and newborn mortality and morbidity. This project addresses weaknesses in labour care processes and improves connections between health systems and communities. 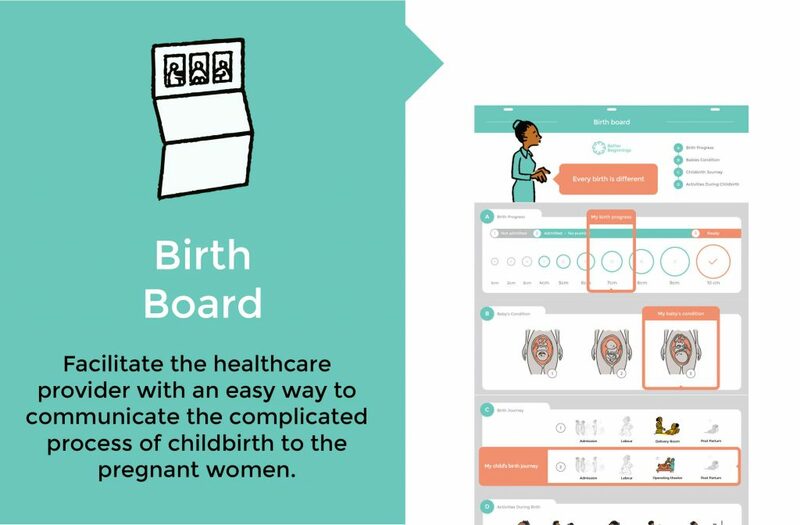 Our objective was to create an innovative set of service prototypes and tools, co-designed with women, community members and healthcare providers, to promote access to quality care for women and their supporters during childbirth. M4ID’s involvement in the BOLD project is now coming to a close and we are pleased to present an overview of the service prototypes and tools we produced. M4ID worked in eight hospitals and their catchment communities in Nigeria and Uganda. We brought together women, their families and health workers and together we developed “Better Beginnings”, a service concept which creates a better understanding of pregnancy, better preparation for decision making and action, and greater feeling of control and being cared for. Better Beginnings has three elements: “Pregnancy Purse”, “Birth Board” and “Family Pass”. 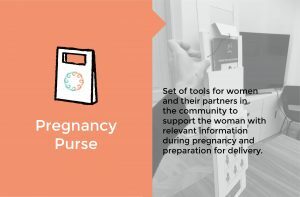 The “Pregnancy Purse” is a folder which holds materials containing information about pregnancy and childbirth. The purse can be stood up or hung on a wall, like a picture frame. It has carry handles and is small enough to fit into a handbag, something which the women who participated in the design process told us was important. The “Pregnancy Purse” safeguards the pregnant woman’s ANC records, mother’s book or other documents. It contains a visual tracker of her antenatal care (ANC) visits, a pregnancy calendar which visualises the stages of pregnancy and a series of cards with commonly asked questions. The “Birth Board” is designed as a preparation and communication tool used by a nurse or midwife in the counselling session during ANC, as well as during labour and childbirth, to better convey the process of childbirth. The “Birth Board” contains different visualisations of the cervical dilation progress, the baby’s condition and the pregnant woman’s path through the health facility from admission to labour to childbirth and postpartum. It also contains recommendations to encourage the pregnant woman’s autonomy and control over her childbirth experience. The woman will be able to understand what to expect as she moves through the labour and childbirth process and is encouraged to express any concerns she might have. The tool reinforces the message that each birth is different and each woman has unique needs. The “Woman’s Pass” contains basic personal information and her birth companions’ contact information, as well as pregnancy related information including her arrival time, personal preferences and the status of her labour progress. 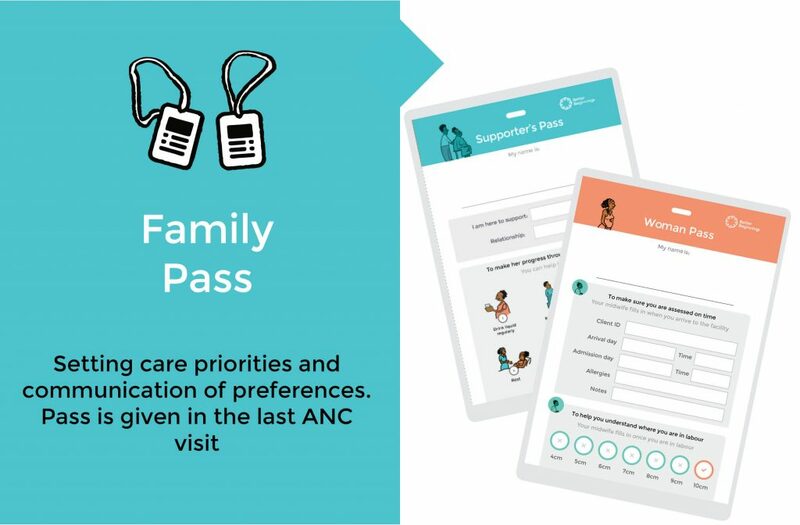 The information on the Woman’s Pass helps the health providers to get a quick overview of the women’s unique needs and preferences to enable quick and effective decision making. For the pregnant woman, the pass is a tool to follow her own care journey and encourage her to express her needs. With the help of the visible arrival and admission time, she and her supporter can follow up to make sure she is assessed and cared for in a timely manner. The “Supporter Pass” enables the birth companion to be a easily identified within the facility when he or she is needed. The pass also gives the birth companion key information on how to support the pregnant woman during the birth process. The next step in the development of the service concept is to translate the tools into local languages then test and evaluate the tools and marketing in facilities in Uganda and Nigeria. Through observing the designs in use, new insights will emerge that will need to be incorporated into the end solutions. Testing the tools in different contexts such as rural and urban, high and low volume facilities will also yield insights on needs for adaptation.